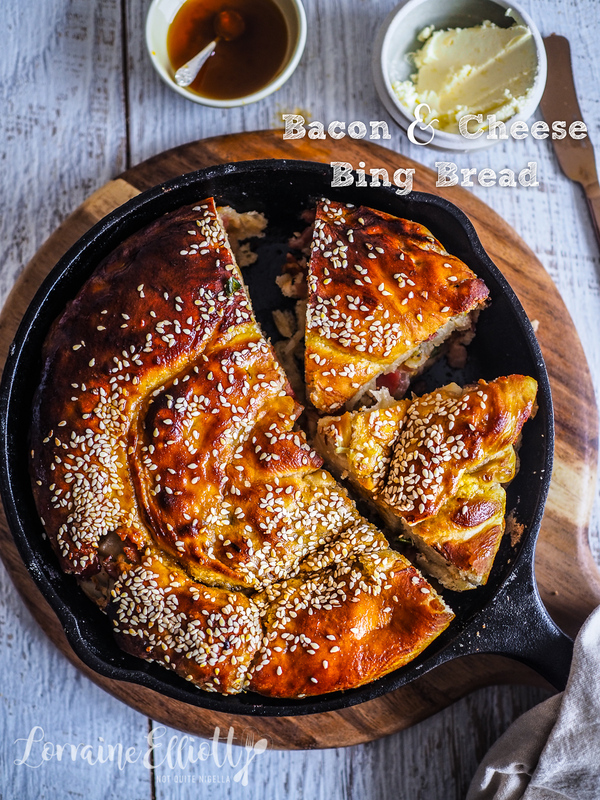 This bacon, cheese and potato bing bread has to be tried at least once. Sure, you could jet off to Chicago and try it at the Michelin starred Parachute restaurant in Avondale. 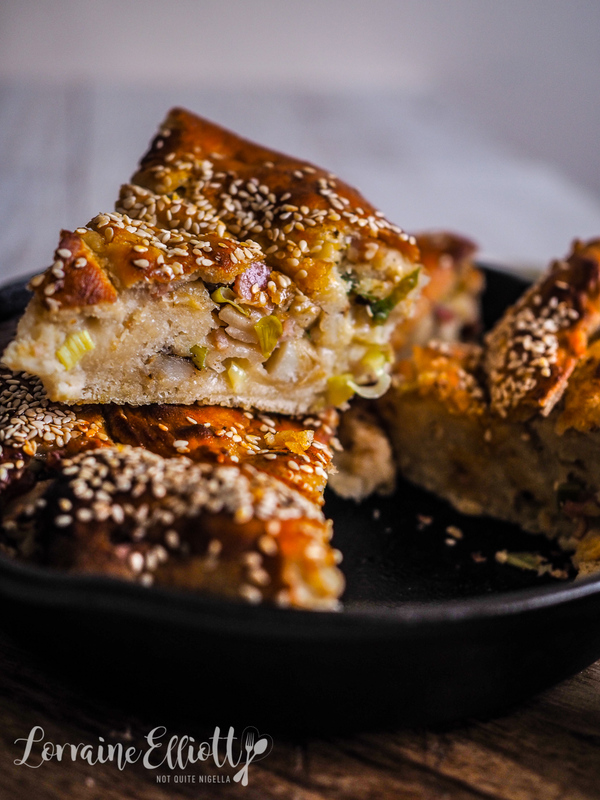 But if you want to try it a bit closer to home, you can make their famous bread yourself! He has described me as someone that constantly surprises him and I suspect that is not always in the nicest way. He's right though, I do love to have secrets and I keep others secrets well. Because people are layered and it keeps things interesting no? And you think you know your spouse but then things come up that make you realise you don't know them at all. Like when he casually said to me the other day that he doesn't like yum cha. "Um WHAAAAATT?" I said, putting my hands up. We were in the car and luckily I wasn't at the wheel because I may have braked HARD. "Who on earth doesn't like yum cha?" I said aghast. I mean I am just getting past the fact that he is team dumpling and I'm team noodles and then he throws this revelation at me. His reasoning is that at yum cha you can never get what you want. It's always trying to find things and your favourite item never comes past. "But that's the fun of it, it's the challenge!" I said. I guess as a very introverted person he prefers to eat without a fuss and go whereas I love the interaction and play of it all. He also doesn't like bread and feigns a gluten intolerance. But in the vein of surprises he loved this bread. It has an abundance of filling which makes it so moreish but it is also a magical combo of flavours. This is based on a recipe by Parachute although theirs was double this and apparently made 6 small breads but I had a largeish cast iron pan. I made a couple of changes and one of them was serving this with chilli oil to give it an extra kick of flavour. The sour cream butter is cooling while the chilli oil was spicy which made for a delicious contrast. And perhaps why I couldn't stop eating it! So tell me Dear Reader, are you a good secret keeper? And have you ever eaten the entire thing when you meant to share it? And do you like yum cha? And team noodle or dumpling? 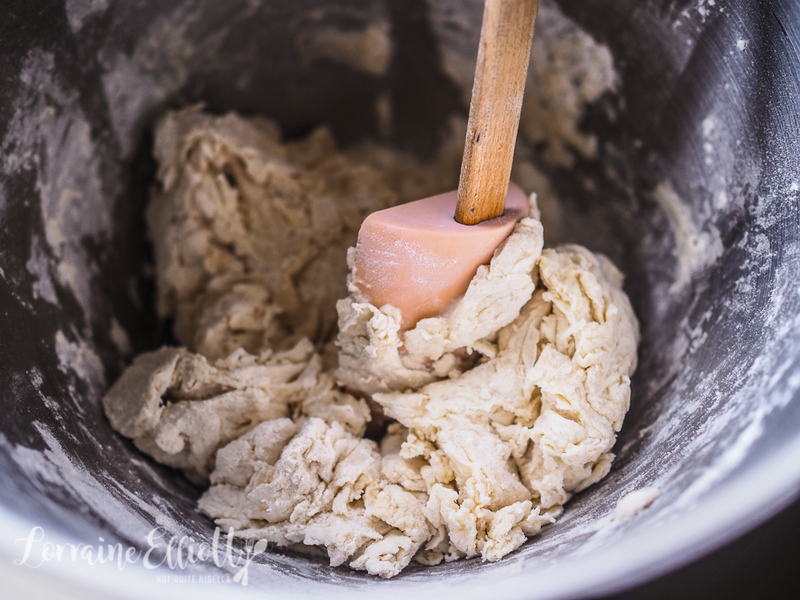 Step 1 - With a spatula mix the flour, water, yeast and sugar in the bowl of an electric mixer until it becomes a shaggy textured mixture. 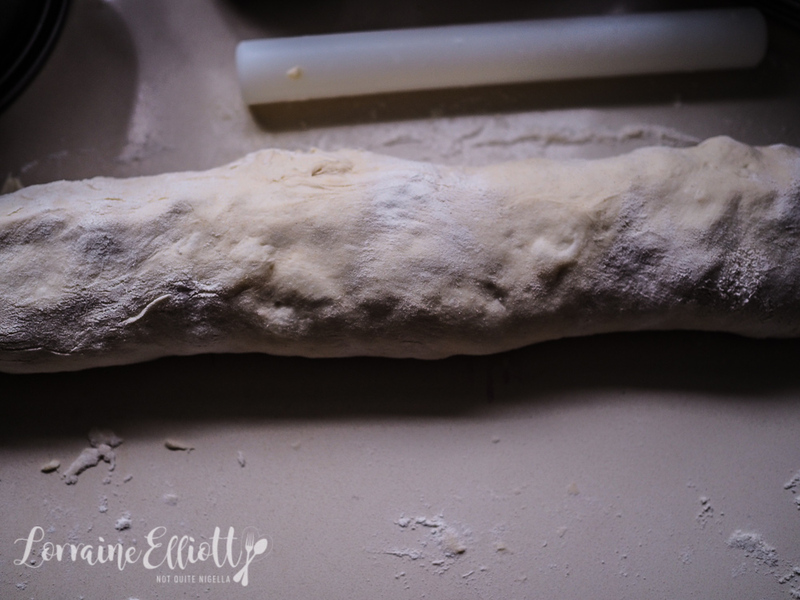 Fit a dough hook and knead for 6-7 minutes or until it becomes smooth and elastic in texture. Step 2 - Oil a bowl (I use the same bowl) and shape the dough into a smooth ball and place in the bowl and cover and allow to rise until triple in size (I put the bowl in another bowl of hot water changing it three or four times). It may take anything from 1 to 1.5 hours. Step 3 - While it is rising, make the filling. 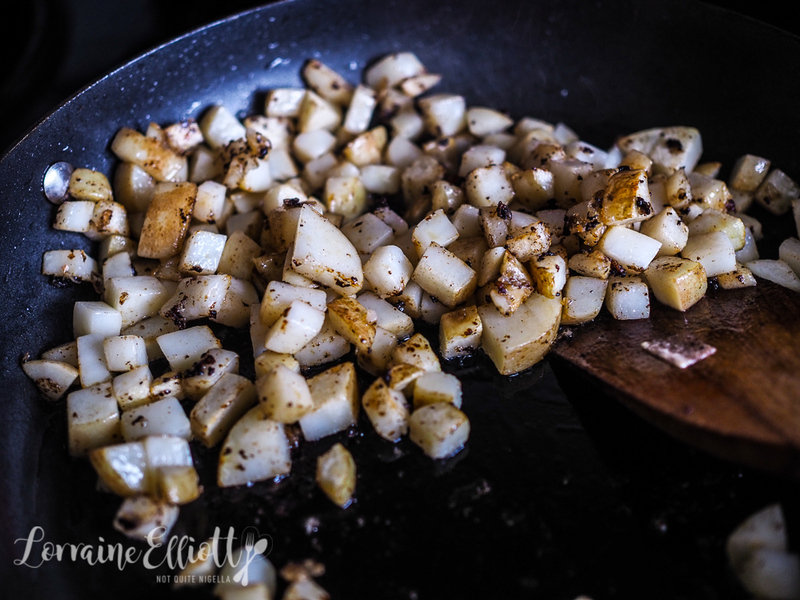 Fry the bacon in a frypan and then fry the potatoes in the bacon fat and season these. Set everything aside to cool. Also whisk the butter and sour cream together and place in the fridge. Step 4 - Once the dough has risen punch it down and knead in the salt. 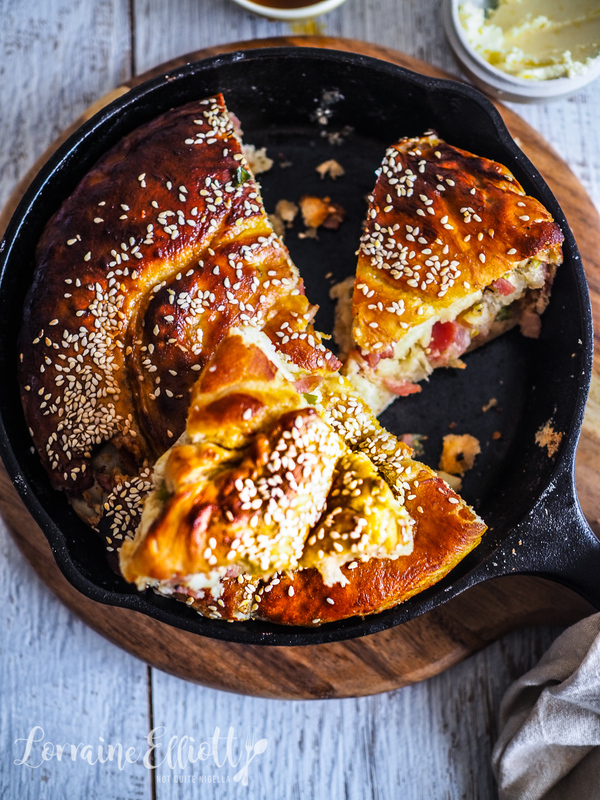 Grease a 22cm/8.8inch cast iron skillet and preheat oven to 180C/350F. Flour a large surface and roll out the dough into a large rectangle. 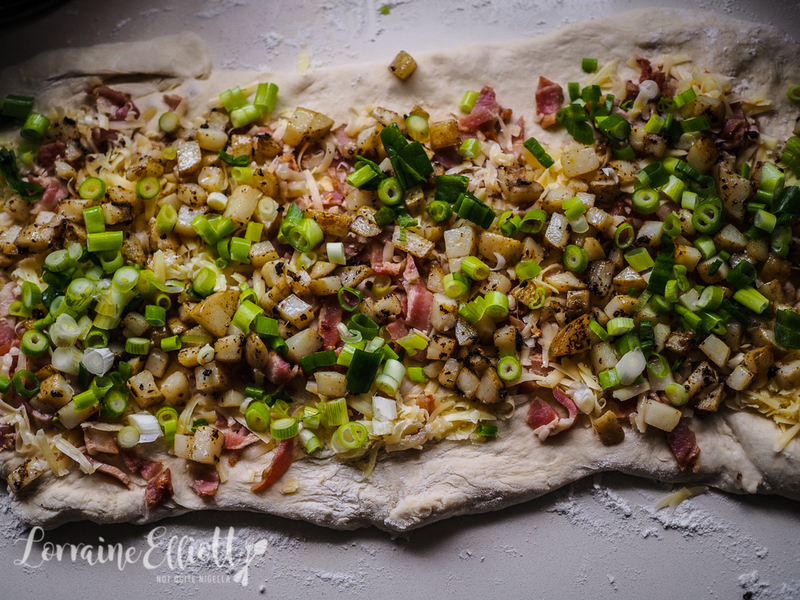 Sprinkle the dough with the bacon, cheese, onions and potatoes. 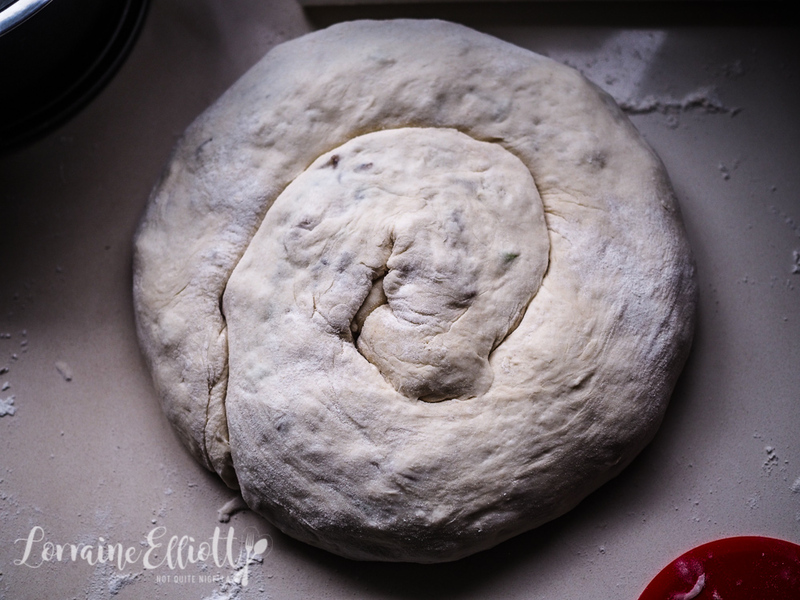 Roll up to create a large log and then shape into a circle and transfer to the greased pan. Step 5 - Brush with the sweet soy sauce, sesame oil and chilli oil and sprinkle with sesame seeds. Bake for 30 minutes. Allow to cool for 15 minutes and then remove from the pan and slice up and serve with more chilli oil and sour cream butter. 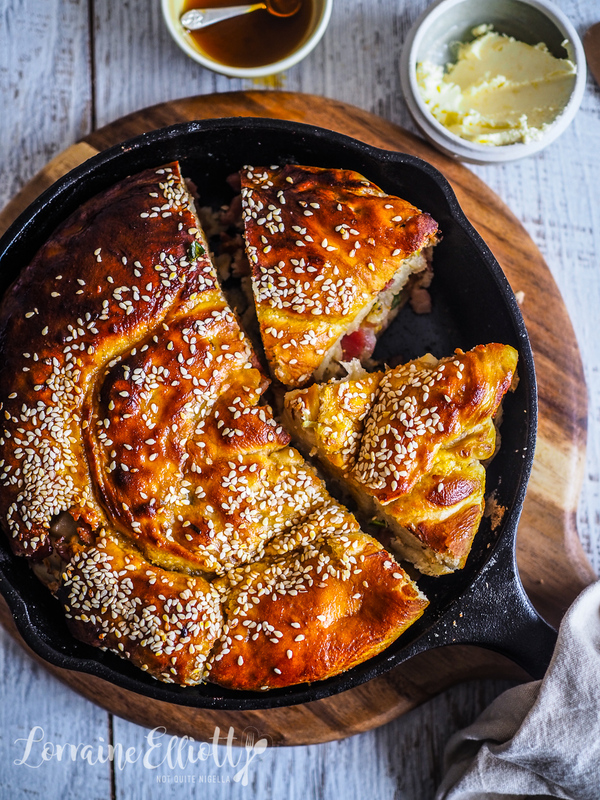 recipeEasy Farmer's Market Stuffed Sourdough Loaf for Australia Day! 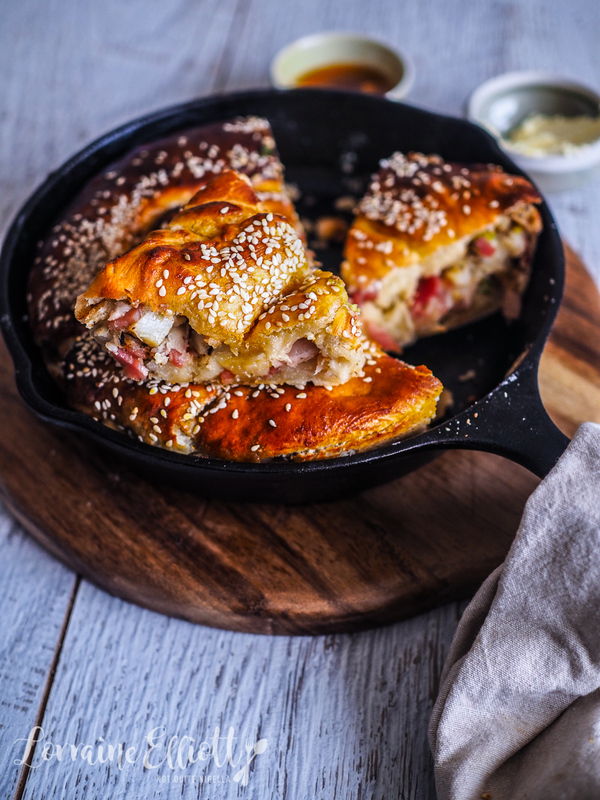 recipe Easy Farmer's Market Stuffed Sourdough Loaf for Australia Day!